A pair of Hollywood classics that won Best Actor Oscars for their leads is the inspiration for this Kojak episode. The Manhattan South Squad has a pair of homicides connected to the docks, but those people have a code of silence stricter than the Cosa Nostra. 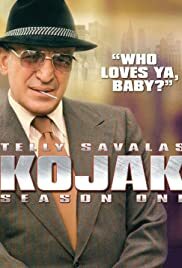 The second of these leads Kojak to Cliff Osmond who is best known for playing the private detective in The Fortune Cookie. In this story, Osmond is a Gypo Nolan type who's just too dumb for his own good. A gang of hijackers befriend him headed by Charles Bergansky and they let him win at cards just to insure that he flashes money around and then gets second thoughts they can let the word out that he's a rat. Both On The Waterfront and The Informer are woven into this story and Cliff Osmond plays a sober Victor McLaglen in a good Kojak episode.